(Nanowerk News) Ridges of silicon can trap and guide light on dimensions as small as just a few hundred nanometers. But the way light behaves in these structures is dependent on its polarization. This effect limits the potential of the technology for a number of applications. A polarization rotator that can help to correct this has now been integrated into a waveguide, which is no more than 400 nanometers across, by Jing Zhang and co-workers at the A*STAR Institute of Microelectronics in Singapore ("Silicon-Waveguide-Based Mode Evolution Polarization Rotator"). Silicon-based photonics research opens up the possibility of tiny optical circuits similar to those that have revolutionized the electronics industry. But at such small dimensions, the difference between the height and the width of the waveguides means that an electromagnetic wave with an electric field oriented along the horizontal direction – known as the transverse-electric (TE) mode—travels at a different speed to that with vertical polarization – the transverse-magnetic (TM) mode. "This 'structural birefringence' will affect devices used in high-data-rate applications," explains Zhang. Fig. 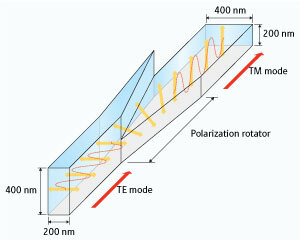 1: A schematic diagram showing how the polarization rotator changes TE-mode light (with the electric field polarized horizontally) in a 200 × 400 nm silicon waveguide into TE-mode light in a 400 × 200 nm waveguide in the space of just 40 µm. An effective solution to this problem is to use a 'polarization diversity scheme', in which the optical signal is split into two separate beams: one with vertical polarization and one with horizontal polarization. A special optical component rotates one of the beams by 90°, which orients the beams in the same direction. The beams then travel along identical silicon waveguide circuits before the reverse sequence of events reconstructs the optical beam at the far end. Zhang and her co-workers integrated their polarization rotator into a silicon waveguide (Fig. 1). Their device consists of two tapered structures that connect an input waveguide 200 nanometers wide and 400 nanometers high to an output waveguide 400 nanometers wide and 200 nanometers high. In effect, the rotator turns the waveguide onto its side with the light inside it. The silicon waveguide, surrounded by a cladding layer of silicon oxide, is 3 millimeters long in total. Simulations indicated that a longer wavelength required a longer rotator. With this in mind, the team tested devices with lengths of between 40 and 100 micrometers. The component could rotate laser light at wavelengths between 1,530 and 1,570 nanometers. Both TE-to-TM and TM-to-TE conversion was possible, although the former was much more efficient. "A polarization rotator is just one of the key components necessary for polarization diversity schemes," notes Zhang. "The next step will be to develop the other elements to complete a whole diversity circuit."